We were proud to be able to play a major part in a plastic recycling scheme that recently launched in Rhyl in Wales. 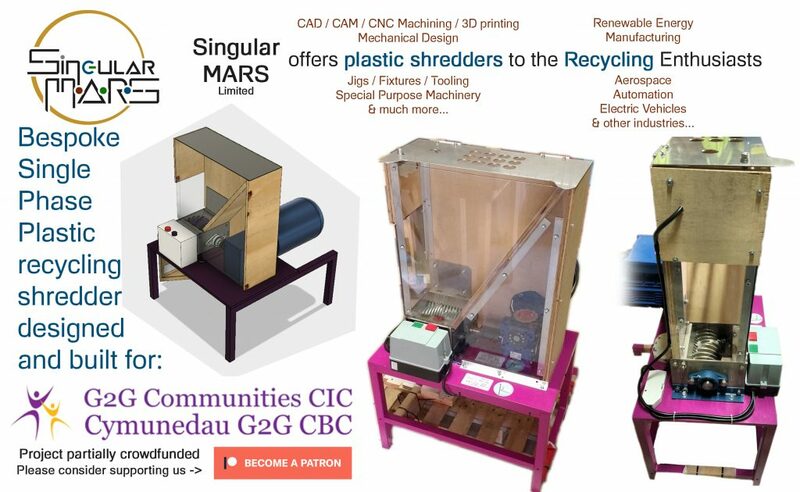 Singular MARS developed a standalone plastic shredding machine mounted on a bright purple frame – a first for us – at the request of the client G2G Communities, a Community Interest Company, who wanted the machine to match their company branding. Once completed, the machine looked so good we almost didn’t want to see it leave our workshop, but alas it was destined for an exciting and of course very important mission in Wales. This shredder is being used at G2G Communities’ 3D printing centre to help educate schools, parents and organisations on the importance of recycling and how recycled plastic can be used to produce usable objects using 3D printing. We were able to offer this machine at a subsidised price thanks to your regular donations, so don’t forget that you’re taking part in cleaning up the environment, thanks! You can read more and watch their launch video here. 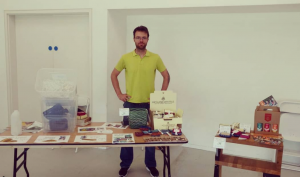 We mentioned in our last update that we were going to exhibit at the Zero Waste Expo in Essex on Earth Day, organized by Repair Reuse Recycle CIC. It was a terrific event with dozens of exhibitors all focused on showcasing products and solutions designed to reduce waste as well as to repurpose items in new and creative ways. Singular MARS was exhibiting next to our good friends, Precious Plastic Den Haag, and together we spoke to hundreds of visitors about the life cycle of plastic and how to recycle plastics to create beautiful new products. We were also next to the charity WasteAid, who we invited and were promoting the fantastic work they are doing across Africa, turning the problem of waste into an economic opportunity. Read more about the event here. As we’ve mentioned before, at Singular MARS we feel passionate about investing in like-minded, ethical companies that are working towards a better future. Over the past month, we have invested with a small contribution in The Big Lemon who just launched a £405,000 bond offer to raise money for three new electric buses that will enable them to run a network of six public bus services in Brighton & Hove with fully electric, zero emissions vehicles powered by solar panels on the roof of the bus depot. We love this idea, saving the planet one eco bus at a time, and hope you love it too. You can learn more about their great work here. Finally, I wanted to remind you about our regular donations to Dave Hakkens (Precious Plastic), Fully Charged Show, Wikipedia, and Scott Santens who advocates for a Universal Basic Income, that keep happening thanks to you. Please consider supporting us so that we can continue to get involved in these as well as other exciting projects, and don’t forget to follow us on Twitter,Facebook,InstagramandLinkedIn. Next: Singular News #8 : Keeping busy!